How to Fix "The action can't be completed because…"
“The action can’t be completed because…” Many people thought they can delete any file from their computers as long as they want, until they get such an error when trying to delete a file or folder. Is it a virus? Possibly, but it could also be a locked or ghost file or folder that refuse to be deleted. How can we force delete a file or folder from hard drive, USB or SD memory card in Windows 10/8/7 computer? Here are the analysis and solutions. A warm boot is usually able to close the program that is using the file and allows us to delete the file or folder after reboot. However, in some occasions, files or folders are still undeletable, which is likely related to malware. Don’t panic. Here are two solutions to fix “The action can’t be completed because…” error. A reboot is still suggested to try first. 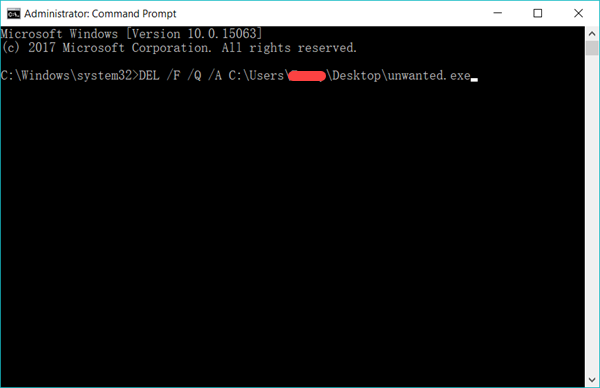 Command Prompt is a powerful feature of Windows provided for technical users. One of its functions is to force deleting undeletable folders and files. It works for most Windows versions. The following is the force delete file CMD for Windows 10. Step 1. Type “Command Prompt” (without quotes) in Windows 10 search bar. Step 2. Right click on Command Prompt and choose Run as administrator. Step 4. Press Enter. The undeletable file will be permanently deleted. /F: stands for force delete. /Q: stands for quite mode. /A: stands for various file attributes such as read-only, hidden, ready for archiving, etc. C:\Users\Your Username\Desktop\unwanted.exe is the path of the undeletable file. This method also works if you want to delete undeletable files from USB drive or SD card connected to PC, so you can replace it with any path that you want to force delete file from. When we find that a downloaded software contains ads or virus and want to remove it from our computer, it often turns out that we can not to delete the software folder successfully. In this case, we can seek help from file unlock tools which can kill the running program progress and unlock the folder so as to delete them permanently. Here we recommend Unlocker. Its latest update was in 2013, but this free file unlock tool still works for Windows 10/8/7 like a charm. Step 1. 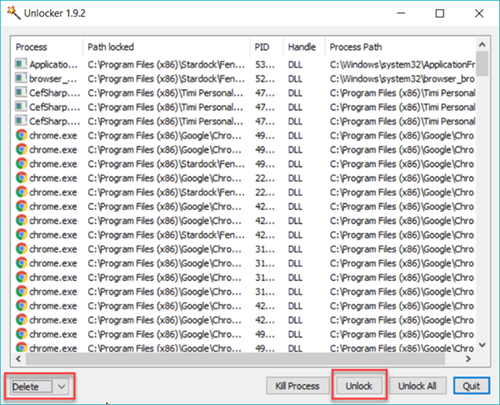 Install Unlocker on your computer. The tool will be added to right-click menu. Step 2. 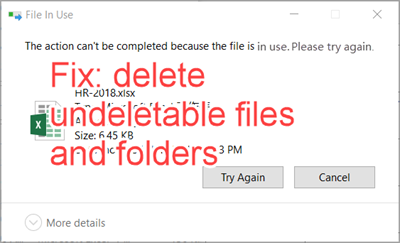 Browse for the undeletable folder on your computer with Windows Explorer. Step 3. Right click on the folder and choose Unlocker from the menu. This will open Unlocker program. Step 4. Choose Delete from the bottom-left box, then click Unlock. Note: If the folder or file is not locked, the program will say “No Locking handle found”, but it can still help you delete, rename or remove the target folder or file. Now you should know how to force delete undeletable files and folders in Windows 10/8/7 computer when “The action can’t be completed because…” error appears. If you mistakenly delete important files, please check how to recover files from Windows 10, which also works for earlier versions of Windows.